Hot off the presses of the hard worked minions over at Sony's PR people They have now formally released the name of the Spider-Man Reboot as "The Amazing Spider-Man™". Still no synopsis has been released as yet. 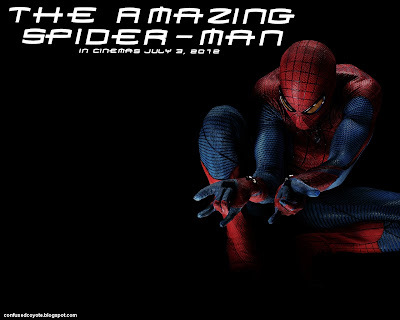 LONDON, February 15, 2011 – Columbia Pictures announced yesterday that the title of the next Spider-Man film will be The Amazing Spider-Man. If you want, then here is some wallpaper for you. The film, which is now in production and is being shot entirely in 3D, will be released on July 3, 2012. The film stars Andrew Garfield, Emma Stone, Rhys Ifans, Denis Leary, Campbell Scott, Irrfan Khan, Martin Sheen, and Sally Field. The film is directed by Marc Webb from a screenplay by James Vanderbilt and Alvin Sargent and Steve Kloves based on the Marvel Comic Book by Stan Lee and Steve Ditko. Laura Ziskin, Avi Arad, and Matt Tolmach are producing the Marvel Entertainment production for Columbia Pictures. The executive producers are Stan Lee, Kevin Feige, and Michael Grillo. The film’s official website is www.TheAmazingSpiderMan-movie.com.